(VEN) - Vietnam’s exports to India maintained strong growth in 2018 and the two countries will make further efforts to raise bilateral trade turnover to US$15 billion. According to the General Department of Vietnam Customs, trade turnover between Vietnam and India in the first 11 months of 2018 reached US$9.94 billion, up 45 percent compared to a year ago. Vietnam’s exports to India reached US$6.14 billion, a year-on-year increase of 82.2 percent; meanwhile imports reached US$3.8 billion, an increase of nine percent compared to the same period in 2017. Vietnam’s key exports of machinery, equipment and spare parts to India maintained its leading position, with the export value of US$1.63 billion, an increase of 450 percent compared to a year ago, accounting for 26.55 percent of Vietnam’s total exports to that market. Exports of mobile phones and components earned US$785.75 million, a year-on-year increase of 54.4 percent; computers, electronic products and components saw an export of US$736.86 million, up 60 percent over the same period in 2017. In particular, rattan, bamboo, sedge and carpet exports surged, reaching over US$5 million, a 15-fold increase against the same period in 2017. Raw materials and fuel were Vietnam’s main imports from India to serve domestic industries. Machinery, equipment and spare parts topped the list at US$448.94 million, accounting for 11.8 percent of Vietnam’s total imports from India. Imports of cotton of all kinds ranked second at US$363.61 million, a year-on-year increase of 48.4 percent, followed by iron and steel with US$355.91 million, seafood with US$321.59 million, and pharmaceutical products with US$232.06 million. In addition, imports of animal and vegetable oils were valued at US$24.79 million, a 17-fold increase compared to a year ago. Auto parts, plastic materials, and common metals recorded import growth of 186.5 percent, 120.2 percent, and 107.2 percent, respectively. 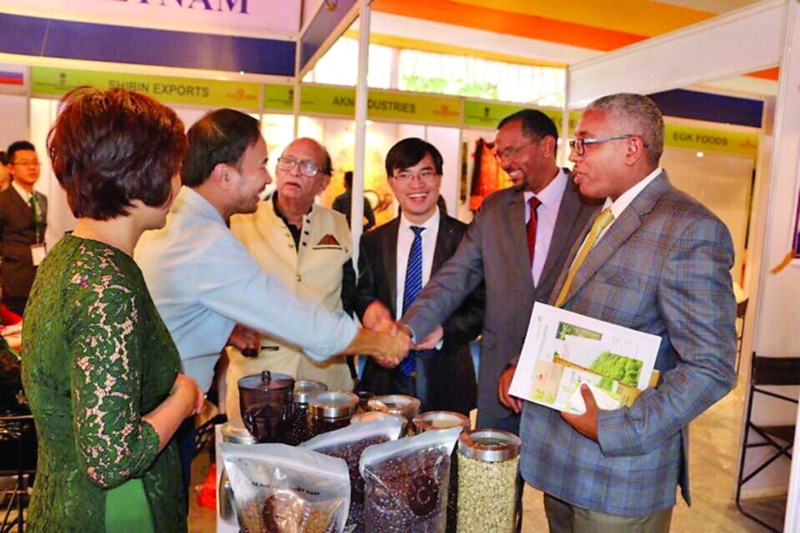 The Vietnam Trade Office in India has contributed significantly to paving the way for Vietnamese goods. 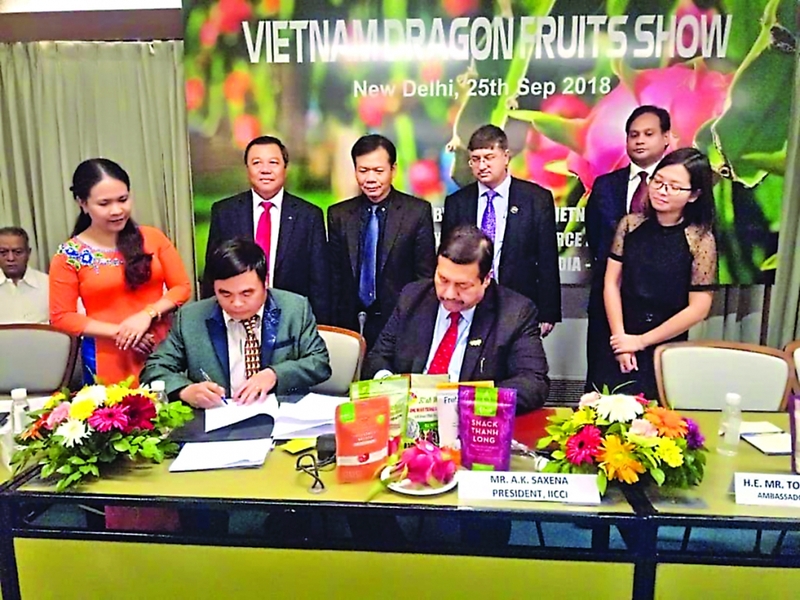 In 2018, the office coordinated with the Binh Thuan Department of Industry and Trade and Indian authorities to organize trade promotion activities in order to introduce Vietnamese fruits such as dragon fruit in New Delhi - the capital of India, and Mumbai - the international financial center. The office also promoted the organization of business forums, providing opportunities for the two business communities to meet partners, exchange information and sign contracts. The office cooperated with Vietnam’s trade promotion agencies and associations to support businesses with trade promotion programs in the fields of electronics, engineering, garment and textile, leather and footwear, fiber, chemicals, iron and steel, agricultural products, and food processing. The office also coordinated with the Indian Chamber of Commerce to organize trade promotion activities in Vietnam. In particular, 50 Indian companies took part in the 18th Vietnam International Hospital, Medical and Pharmaceutical Exhibition (Vietnam Medi Pharm Expo 2018) from August 2-4 at the Saigon Exhibition and Conference Centre (SECC) in Ho Chi Minh City. In 2019, the office will continue to organize trade promotion programs in order to raise bilateral trade turnover to US$15 billion set by the two countries’ leaders, continue to strengthen investment promotion, especially Vietnam’s investment in India, and enhance tourism cooperation. copper wires, and synthetic fibers.